FILE - Smoke rises after a landmine exploded as fighters of Syrian Democratic Forces clear roads after pushing Islamic State militants out of Raqqa, Syria, Oct. 18, 2017. Nearly two weeks after U.S.-backed forces declared victory over the so-called Islamic State (IS) in Syria, local and international groups are rushing to begin a mine clearance campaign in areas freed from the terror group in eastern Syria. As Syrian Democratic Forces (SDF) continue trying to clear the town of Baghuz from the remnants of IS fighters, they also are aware of thousands of landmines and other improvised explosives left behind by the terror group in Baghuz and elsewhere in eastern Syria. Mine experts say that despite defeating IS militants in all areas in eastern Syria, the thousands of civilians who have been displaced because of the war on IS would not be able to return to their homes anytime soon. "We have obtained information that Baghuz and its surrounding areas are full not only of landmines, but also of munitions and other types of explosives," said Mustafa Othman, director of operations at Roj Mine Control Organization (RMCO), a local group that has been engaged in mine-clearing activities across northern and eastern Syria. FILE - A volunteer deminer takes a landmine from the ground in Daraa, Syria, in this still image made from video taken Sept. 7, 2015, provided by the Syrian Center for Demining and Rehabilitation. "These explosives have already taken a lot of civilian lives," he told VOA in a phone interview. Othman said that IS maintains active sleeper cells in the region, making mine workers a key target for potential attacks. "It's going to take months before civilian residents are allowed to return," he said. Nearly 200 civilians have been killed this year, and many others have been wounded because of landmine explosions across northern and eastern Syria, according to local reports. One day after the SDF announced victory in Baghuz, a Syrian driver working with reporters from NBC News was killed by a device that exploded in a house used as a media center for journalists covering the battle. Baran Misko, a Kurdish reporter, was at the scene. "There were seven of us inside the house when the explosion happened; three Syrians and four Americans. It wasn't a typical landmine. It was actually a device that contained a large amount of explosive materials," he told VOA. Misko said the explosion was "so powerful that it burned down the entire building within seconds." Several international groups have been working on demining efforts in Syria, including the Mines Advisory Group (MAG), a British organization that has operations in various countries around the world. FILE - A member of the U.S.-backed Syrian Democratic Forces throws a bomb to check for more explosives at the stadium that was the site of Islamic State fighters' last stand in the city of Raqqa, Syria, Oct. 18, 2017. "On a monthly basis, we dismantle between 10 and 15 tons of mines and other explosive remnants of war in Syria," a coordinator at MAG told VOA. He requested anonymity for security reasons. He said it is difficult to estimate the number of mines planted by IS, but he added that "we consider all areas formerly held by [IS] as mine-affected territory." "We are still clearing some areas that were liberated from Daesh three years ago, so you can imagine the scale of challenges we're dealing with," said the MAG worker, using an Arabic acronym for IS. The United States has been a major contributor of mine-clearance efforts in Syria since the beginning of the conflict in 2011. From 2013 to 2018, the U.S. contributed more than $81 million to humanitarian mine action efforts in northeast Syria, according to a State Department annual report on U.S. mine removal efforts worldwide. "Now that the physical caliphate has been defeated, protecting those military gains by bringing stability to northeast Syria is a key U.S. objective," said Jerry Guilbert, Chief of Programs for the U.S. Department of State's Office of Weapons Removal and Abatement. "Addressing the explosive hazards that are left in ISIS's wake is a key priority for U.S. objectives in northeast Syria," Guilbert told VOA during a teleconference Wednesday, using another acronym for IS. 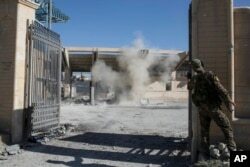 The report, released Wednesday, also highlighted that U.S. implementation partners have cleared more than 25,500 explosive hazards from more than 24.5 million square meters (6,054 acres) in Syrian cities and towns freed from IS, including Raqqa, once IS's de facto capital. FILE - A resident points to what he believes is a landmine in the village of al-Heesha in Raqqa district of Syria after it was captured from Islamic State, Nov. 15, 2016. "Raqqa is one of the most heavily contaminated places on Earth that our programs have come up against since 1993," Guilbert said. He said that through U.S. programs, upward of 300 Syrian nationals have been trained to conduct international demining standards, adding that U.S. efforts in this aspect are largely focused on enabling stabilization and humanitarian aid in areas previously controlled by IS. "We are clearing facilities to allow MSF [Doctors Without Borders] to establish health clinics. We are clearing water pumping stations and sewage facilities so that clean water can begin flowing into Raqqa. We're clearing electrical grids and schools so life can begin returning to normalcy," Guilbert said. The U.S. State Department annual report comes one day before the International Day for Mine Awareness and Assistance in Mine Action on April 4. Since 2005, the U.N. has been observing the day each year to raise awareness about landmines and explosive remnants of war, and efforts to eradicate them. "On this International Day for Mine Awareness, let us reaffirm our commitment to eradicating the horrendous damage caused by landmines and assisting those who have been harmed by their use," said U.N. Secretary-General Antonio Guterres in remarks about the day. This year, the U.N. has launched a campaign called "Safe Ground" to step up mine removal efforts in conflict zones. "With this global campaign, our aim is to turn minefields into playing fields, and to raise resources for victims and survivors of armed conflict," Guterres said.